With only nine games left in the regular season, the Pittsburgh Penguins currently sit in third place in the tight-knit Metropolitan Division. They are three points out of first place, but also only four points away from being out of the playoffs entirely. 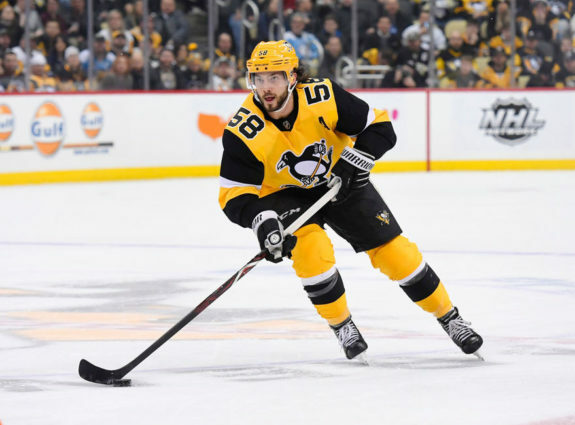 The division is poised to send five teams to the postseason, and the Penguins have had ample opportunity to climb into the top spot, but some untimely losses have landed them in third. Even with a plethora of injuries, the Penguins have battled hard to maintain a playoff spot, and with Evgeni Malkin recently being deemed week-to-week with an upper-body injury after a devastating crosscheck from former teammate Robert Bortuzzo, things just got a little bit tougher. One thing is for sure, Matt Murray is not the problem, despite constantly being used as the scapegoat. 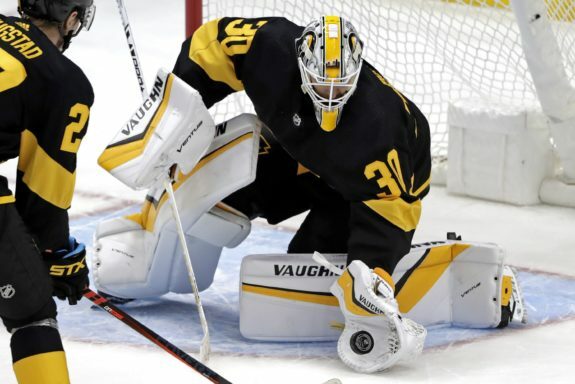 It’s one of the most difficult things about being a goaltender in the NHL, but for whatever reason, Murray seems to take a social media beating whenever the Penguins end up on the losing end. Even after the Penguins’ disappointing 2-1 loss to the Philadelphia Flyers on March 17, where they surrendered the game-tying goal with only 18 seconds left in regulation and then lost in overtime, Murray was once again heckled relentlessly. No mention of poor defensive play by Sidney Crosby or multiple failed attempts at an empty cage with the Penguins up a goal, Murray continues to be the player that fans love to point their fingers at, and it needs to stop. If you look at Murray’s full season statistics, they are fairly average, but if you take a look at his stats since returning from injury on Dec. 14, he ranks up there with the league’s best. He missed about a month with a lower-body injury, but the break was exactly what he needed after giving up 36 goals in his first 10 starts this season. He fought the puck a lot and really struggled with his angles and rebound control, but ever since he returned, he has been a beast. Since his return on Dec. 14, Murray has 30 starts. During that time frame, he ranks third in wins (20), first in save percentage (.928) and fifth in goals-against average (2.42) amongst all goaltenders with at least 25 starts. He has been magnificent and has made a handful of saves that could be serious contenders for save of the year. I don’t know whether or not it’s just easier to blame the goaltender whenever things are going poorly, but the statistics prove that Murray has been a main reason why the Penguins are still in the playoff picture. If he was simply average, they would likely be on the outside looking in. While all goaltenders have to be thick-skinned, a little fan support wouldn’t hurt. The 24-year-old has already led the Penguins to two Stanley Cups, and has continued to improve every season. Whether or not he is the long-term answer can be debated, but right now he is playing as well as any other netminder in the league. If Penguins fans want something to blame for them only winning three of their last six games, the power play has been a glaring issue. Without the services of Kris Letang and Malkin, the power play has been an absolute nightmare. In their last three losses, the Penguins are 0-for-11 on the man advantage and at times has looked downright embarrassing. They’ve also given up a shorthanded goal in that stretch, so they’re technically minus-one. The first unit has been atrocious as they have continuously tried to make tic-tac-toe type plays when finally establishing possession in the offensive zone. Phil Kessel has been a turnover machine in the neutral zone and has continuously panicked with the puck whenever receiving any pressure. The second unit has had the higher quality chances by taking a more simplistic approach, but the Penguins are going to have to get their power play in order if they want to make a serious run at another championship. Penguins fans have the tendency to panic more so than the average fanbase, but for now there is really no reason to. They have been decimated by injuries but continue to persevere no matter who is slotted into the lineup. With Letang due back soon, and Malkin’s injury not deemed overly serious, the Penguins will be fine. Murray will likely continue to be the scapegoat for losses, but fans need to begin to realize what they have between the pipes. He is an elite goaltender who has already proven multiple times that he can lead this team to the promise land. 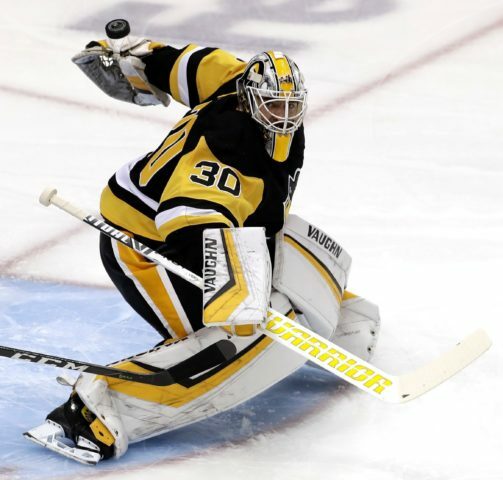 In those same three losses where the power play faltered, the Penguins were 11-for-12 on the penalty kill, and you know what they say, the goaltender has to be the best penalty killer in order for it to be successful.